What can be better than being in Amish Country in the fall? Perhaps the summer or spring? Amish Country in Ohio is composed of Holmes, Wayne, Tuscarawas, Coshocton, Knox, Ashland, Richland and Stark Counties. 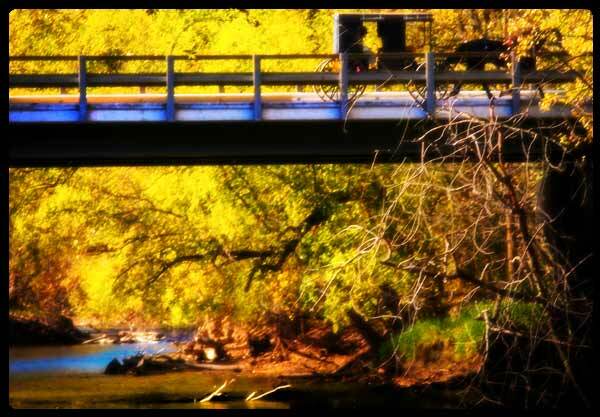 All combined, these areas offer a variety of good food, attractions and some of the most beautiful country in the state. Our common view of the Amish as being a reflection of our own past, seems to allow us to go back in time when life was a bit slower and we could take pride in our daily accomplishments. The Amish found a way to not only survive but to thrive in our technology filled world, without compromising their beliefs in their total obedience to their church and their separation from the rest of the world. 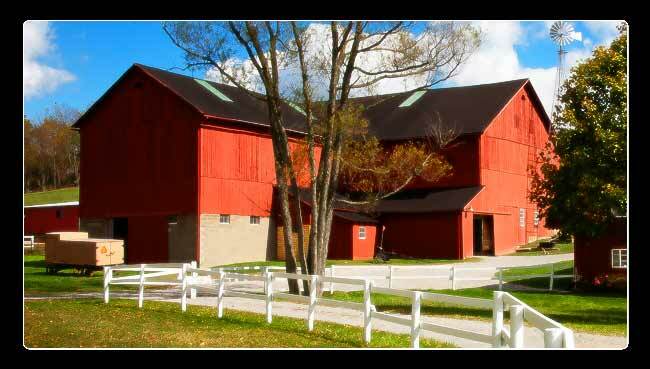 Much of the area we refer to as Amish Country is loaded with tourist attractions based on the Amish lifestyle. This has its pluses, but it also tends to give most people a false impression. 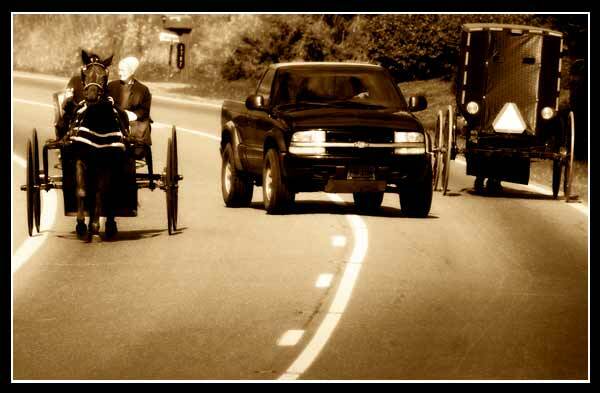 The horse and buggy is the most common image the tourist has of the Amish. 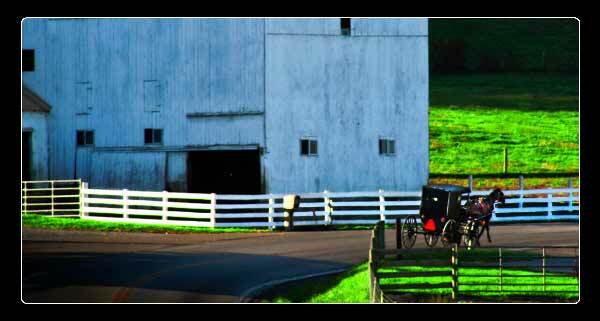 It is true there are plenty of horse and buggies in Amish countryside, but their way of life far exceeds this notion of the simple life, no matter how much we want to stick them into that definition. Whatever your opinions are concerning the Amish, they are probably no worse than anyone else's, even though they're probably wrong opinions. I think it is almost impossible for outsiders to truly understand what being Amish really means. Still, those opinions should not stop us from appreciating their workmanship, the countryside that they farm, and their simple life styles. If that lifestyle has been commercialized to a great extent for gain, so be it. Unless you're from Amish Country, you probably don't have a real good idea of exactly who the Amish people are, or what makes them different from the English as they call everyone that is not Amish. Ohio has several counties with large populations of Amish households and that number is growing. Wayne and Hardin counties both have large Amish contingents, but it is Holmes County with the largest population numbering about 42% of all residents in the county. It is estimated that before 2030, Holmes county will have more Amish living in that county than "English" (the term used for all non-Amish). It has been calculated that Holmes County has the largest Amish population of any county in the country. Today there are about 60,000 Amish living in Ohio making it the largest Amish state in the country. That makes Ohio the largest Amish state in the country. 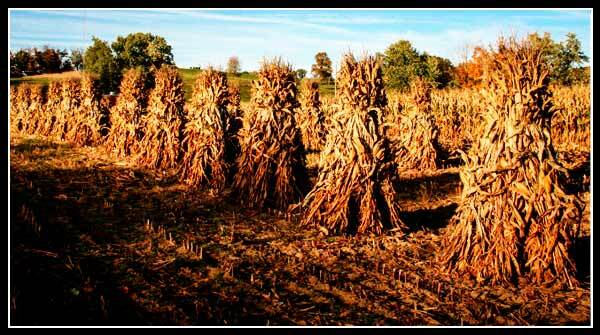 And although this is a relatively confined area, one can not make sweeping generalizations about the Amish. The Amish population is growing in size. First, not all Amish are the same, or have the same beliefs. In general in you can't generalize about them. They are all unique in their own ways. There are 4 orders of Amish, with each order being almost completely different from the other. There are the Swartzentruber Amish, the Andy Weaver Amish, the Old Order Amish and the New Order Amish. Each have their own unique social template of what is acceptable and what is not. Even within each order, there are sub-orders of Amish. The Old Order Amish is the most traditional group that has forgone modern technology and still use the horse and buggy for transportation. Church districts are made up of about 20 to 25 families overseen by a bishop. Since the Amish doctrine prohibits contraception, Amish families are growing in size and Amish children are less likely to leave, and more likely to remain either in their own community, or move to another Amish community. Often Amish farms will have multiple generations living on the same farm, but in different houses. 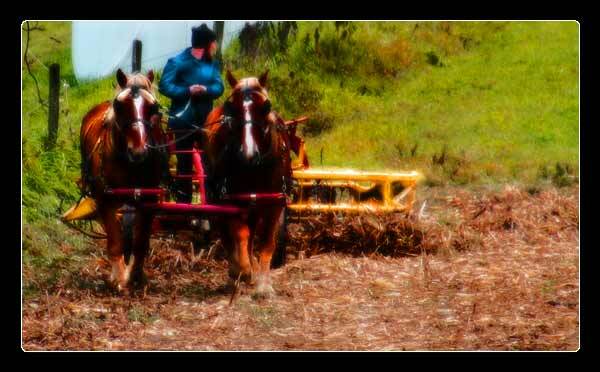 100 acre farms were once the center of all Amish life, that has been slowly evolving. With the increasing number of the Amish population and the soaring land prices, acquiring 100 acres of good farmland has become increasingly difficult. This has caused a change in their society's development. Instead of the large grain farms (corn, wheat and oats), smaller farms in the 10 acre size are becoming more common, growing primarily vegetables. Vegetable production produces enough for multiple families, but also allows them to be sold to the public for additional income. To accommodate these sale, large famer-market auction sites are beginning to take hold. Although the Amish will disagree with each other on certain issues, there are other issues where they are in complete agreement. Those areas are the keys to their religion: complete obedience to their church and keeping separating themselves from the world as much as possible. When traveling in Amish Country, please take extreme caution while driving. The land is hilly and in many places you can come over a rise and find a horse and buggy right in front of you. Amish farms have always seemed to be at the heart of Amish Country, yet today, the number of farms has not increased as dramatic as the Amish population. Many families as their children grow up remain on the family farm by adding new houses. However, in recent years, there has been a shift away from agriculture and into trade work. According to a recent study only about 17 percent of Amish men work on the farm today with the bulk of the rest working as skilled craftsmen. This holds true in most of the traditional Amish counties in Ohio, but not all, Hardin County being the exception where most of the men there work on the farms. The Amish faith actually has its roots deeply embedded with European Mennonites. A deep seated disagreement between two Mennonite leaders, Hans Reist and Jacob Amman, caused a major disagreement within the group causing it to split. One side remained with the Mennonites and Hans Reist, the other sided with Amman after he excommunicated himself from the Mennonite faith. After that, those that followed Jacob began calling themselves Amish, in honor of Jacob Amman. In 1727 the first group of Amish came to America and settled around the little community of Philadelphia. Today there are over 270,000 Amish living in the United States. The Old Order Amish men usually dress in plain, dark colored slacks and vests. Married men have beards. Women wear long, solid colored dresses with an apron and a black bonnet. Around the house, married women wear white bonnets, while single women wear black. The Amish are generally private people and they believe taking photographs where someone is recognizable is forbidden by the Biblical prohibition against making any 'graven image'.